Hi everyone! I feel like it’s been a long time since I posted my last card, but I’m here with a new vintage project to show you. I’ve been wanting to make a male card, since my husband’s birthday is approaching, but for some reason I’m always thinking I should start all over and make a new design. I just want it to be perfect! Another reason for me wanting to create a male project is that tomorrow, March 19, is Father’s Day here. My dear dad passed away a few years ago, and he is missed greatly. He was so charismatic, outgoing, kind-hearted, very smart and proffesional, a great teacher and mentor. He was there for anyone and everyone. A great father. He contributed very much to our country’s agricultural and livestock industry, to education both rural and academic, and most of all he was loved by everyone who knew him. I had to write about him today, because he was a very important part of what I am doing now. Before he passed he told me I should write, he encouraged me to craft and create and he was my very first sponsor. He bought me the Grand Calibur machine back then and he was glad that I had found something that motivated me and kept me active, considering that I had been recently diagnosed with RA. He was the most supportive father, positive and encouraging, a man of faith. Thank you dad… Happy Father’s Day. I worked with 3 different layers of cardstock. 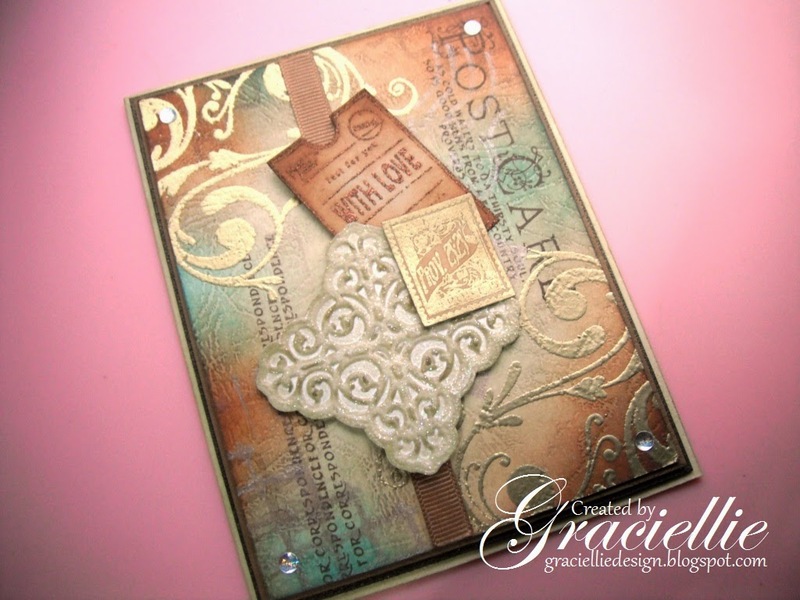 I enjoyed working with the top layer, distressing it, aging the white cardstock and stamping it. It is a lot of fun to create a vintage background. I love how the gold flourishes add elegance to the design. I finished the card with ribbon, but no bow, and some paper embellishments. Thanks so much for stopping by! I enjoyed writing this post a lot, so I hope that you enjoy reading it too. What an unusual and beautiful piece! Thanks for joining us at Craft Hoarders Anonymous! Loved reading this very personal and touching post. Your masculine card is elegant and very beautiful. Thanks so much for joining us at Craft Hoarders Anonymous Challenge #4: Sparkle, Glitz or Glam! Very nice male card. I struggle to make anything masculine! Brought a tear to my eye reading about your Dad….I lost my dad in 2010 and I miss him every day! Thanks for playing along with the Craft Hoarders! I missed you, and your cards of course. It has been awhile, and I was getting worried. I love your story, made me cry, missing my own Father, who passed late 2012. Love your little boy, so cute, great picture. I love the card, very handsome looking. I hope your husband has a great birthday. I was touched by your story!! Thanks so much for sharing your card with us at Craft Hoarders!! Beautiful. I enjoyed looking at your family photos almost as much as looking at your beautiful card. You show that masculine can be glittery. Just gorgeous! What a beautiful tribute to your Father! Thanks for joining us at Craft Hoarders Anon! First, what an amazing story about your dad! What a tribute! The card is wonderful. Perfect for anyone. The colors and and “grunge” but sophistication…hint of sparkle. Love it! Thanks for joining us at Craft Hoarders Anonymous! And congrats on making our FAVORITES for last challenge! 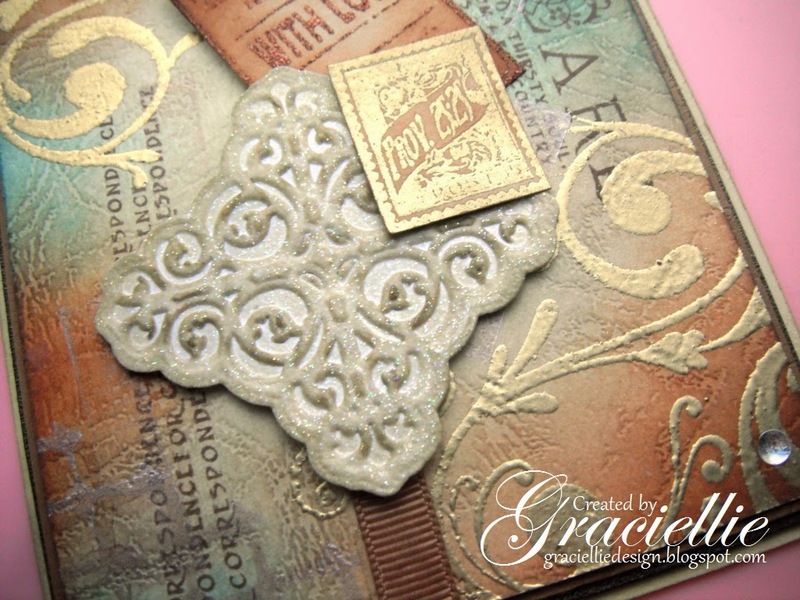 Oh, Gracie, what a beautiful tribute to your precious dad and a gorgeous card! I LOVE it all! Your style is amazing, sweet friend! So glad you've joined us once again this week for the ODBD Shining the Light challenge! Dear Gracie, Thank you for the story of your dear Father's life, he sounds like a great father, and truly loved by all who know him!!! The card you made for him is stunning!!! So beautiful, and I hope you and your father have many years to enjoy the family together!!! What a BEAUTIFUL post! I enjoyed every single word. Your father was truly incredible and I love that his influence is so much a part of your craft. And what a fabulous fabulous card you made! Vintage, male, and just perfect! I've thought of your emails often and last week a little time presented itself and I decided to make a card. It was effortful, but I'm grateful I had your encouragement to do it. Thank you!!! Such a beautiful and touching story about your dad! I am sure he would have been very proud and happy with this tribute to him. Your card is gorgeous and I love all your work. Since I found your blog I was wondering where exactly were you from and was happy and surprised to find such a talented fellow-Honduran 🙂 I from SPS but live in Belgium. Felicitaciones!! Beautiful tribute to your Father! Glad you have many memories of him! Your card looks fabulous! Wonderful background and design! Thanks for joining us again this week at ODBD! HI Gracie!! I am so sorry to hear about your Dad!! Your words about your him brought tears to my eyes!! I can tell he meant a great deal to you! It is wonderful that he encouraged you to craft!! Sorry about your RA!! Your card is gorgeous!! 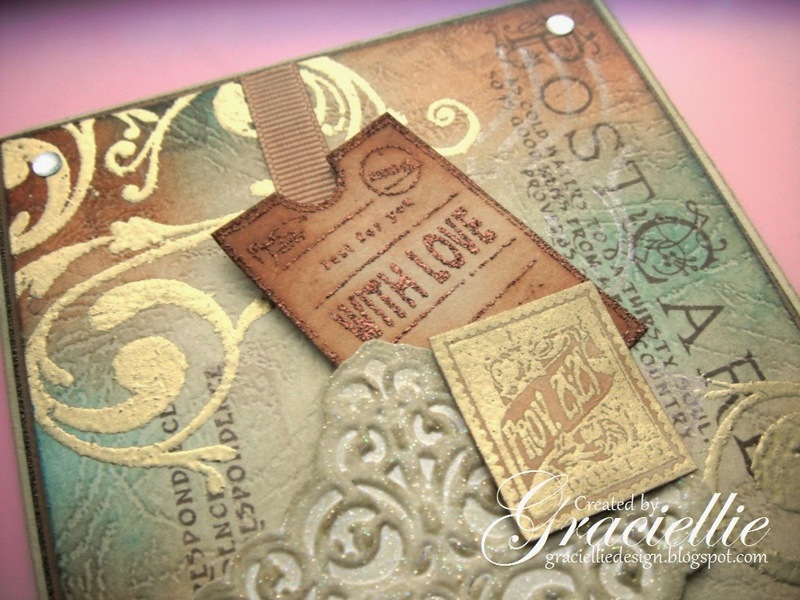 I just love the vintage design, the texture and your embossing!! Thanks for joining us at ODBD!! Lovely project…love seeing your photos, they are a treasure…Thanks for playing along with us at Craft Hoarders Anonymous Challenge Blog. Thanks for sharing your family photos. Love your card. Thanks for joining us again at Craft Hoarders Anonymous! Such a beautiful project. The details are just fabulous. I love it : ) Thanks so much for playing along with us at Craft Hoarders Anonymous Challenge Blog. I hope you can come back to play again soon. Love this beautiful tribute to your dad. Lots of glim and glam, but manly of course! Thanks for joining us at Craft Hoarders Anonymous!